Our stainless steel pan are perfect for caterers, cafeterias, buffet lines and other hot food serving applications where a steam table operations require metal pans instead of plastic. Seamless construction our stainless steel pans are durable, corrosion-resistant and non-tarnishing. Available with and without handles and with optional accessories such as colanders for draining purposes. Our stainless steel colander pans (also known as perforated pans) and drain shelves allow juices and moisture to drain quickly, improves food quality, keeps vapors and flavors while reduces handling. Available with and without handles. Our stainless steel hotel pan lids are available in all the standard pan sizes in a variety of designs to fit your restaurant's needs. 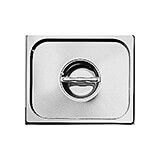 Available with handles, side notches, ladle notch and more. 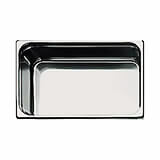 Our stainless steel hotel pans with fixed handles are ideal for searing and poaching. Seamless construction our stainless steel pans are durable, corrosion-resistant and non-tarnishing. They do not react to any food and protect flavors. 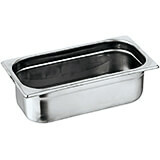 Our stainless steel hotel pans with fixed interior handles are commonly used for searing and flambeing. Seamless construction our stainless steel pans are durable, corrosion-resistant and non-tarnishing. Seamless construction our stainless steel pans are durable, corrosion-resistant and non-tarnishing. They do not react to any food and protect flavors. In addition to in-process control during manufacturing and fabrication. Our stainless steel hotel pans with retractable handles are ideal for food service locations that require handles to easily change pans during serving time while providing the ability to retract the handles into the pan to provide easy access to the food contents. 20.88" X 12.75" X 0.75"
20.88" X 12.75" X 1.5"
20.88" X 12.75" X 4"
20.88" X 12.75" X 7.88"
20.88" X 12.75" X 6"
12.5" X 10.5" X 0.75"
12.5" X 10.5" X 1.5"
12.5" X 10.5" X 4"
12.5" X 10.5" X 6"
12.5" X 10.5" X 7.88"
14" X 12.5" X 2.5"
14" X 12.5" X 4"
This 20 7/8 inches by 12 3/4 inches stainless-steel hotel food pan with retractable handles is a standard size which fits into universal racks, heating elements and walk-in coolers. This standard was intended to rationalize the working processes in food. Exterior And Interior Satin Polished Finish With Ergonomic Stay Cool Hollow Handles.Material: Stainless Steel.Capacity: 10.5 Qt. This 20 7/8 inches by 12 3/4 inches stainless-steel hotel food pan with retractable handles is a standard size which fits into universal racks, heating elements and walk-in coolers. This standard was intended to rationalize the working processes in food. 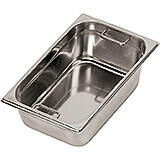 NSF Approved.Material: Stainless Steel.Capacity: 23.25 Qt. 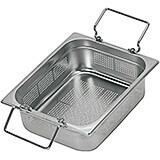 This 20 7/8 inches by 12 3/4 inches stainless-steel hotel food pan with retractable handles is a standard size which fits into universal racks, heating elements and walk-in coolers. This standard was intended to rationalize the working processes in food. NSF Approved.Material: Stainless Steel.Capacity: 29.5 Qt. 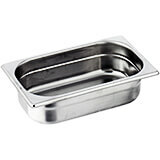 This 12 1/2 inches by 10 1/2 inches stainless-steel hotel food pan with internal handles is a standard size which fits into universal racks, heating elements and walk-in coolers. This standard was intended to rationalize the working processes in food. 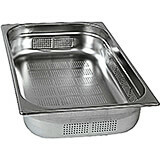 Commonly used for searing and flambeing.NSF Approved.Material: Stainless Steel.Capacity: 10.5 Qt. 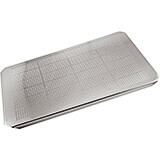 This 12 1/2 inches by 10 1/2 inches stainless-steel hotel food pan with retractable handles is a standard size which fits into universal racks, heating elements and walk-in coolers. This standard was intended to rationalize the working processes in food. 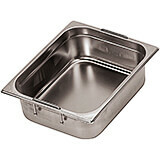 NSF Approved.Material: Stainless Steel.Capacity: 6.38 Qt. 12.75" X 7.12" X 4"
This 12 3/4 inches by 7 1/8 inches stainless-steel hotel food pan with retractable handles is a standard size which fits into universal racks, heating elements and walk-in coolers. This standard was intended to rationalize the working processes in food. NSF Approved.Material: Stainless Steel.Capacity: 4.25 Qt. 12.75" X 6.25" X 2.5"
12.75" X 6.25" X 4"
12.75" X 6.25" X 7.88"
This 12 3/4 inches by 6 1/4 inches stainless-steel hotel food pan with internal handles is a standard size which fits into universal racks, heating elements and walk-in coolers. This standard was intended to rationalize the working processes in food. 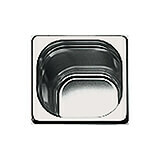 Dishwasher Safe.Material: Stainless Steel.Capacity: 6.38 Qt. This 12 3/4 inches by 6 1/4 inches stainless-steel hotel food pan with retractable handles is a standard size which fits into universal racks, heating elements and walk-in coolers. This standard was intended to rationalize the working processes in food. NSF Approved.Thermo-radiant bottom.Lipped non-dripping edges.Material: Stainless Steel.Capacity: 3.25 Qt. 7" X 6.25" X 4"
7" X 6.25" X 6"
7" X 6.25" X 7.88"